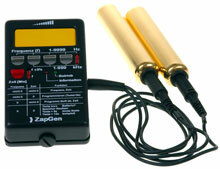 ZAPGen is a small, battery-operated generator which generates precise, digital sinus frequencies in the range of 1 Hz – 999 kHz. This allows a targeted fighting of viruses, bacteria and fungi through the correct frequencies, f.e. according to Rife, Beck or Dr. Clark, all scientists who are responsible for making frequency generating internationally well-known. This device which is easy to operate enables the user to store up to 50 frequencies as one programme, and then to retrieve them by a single touch of the button. In addition, the device offers a wobble-function which counteracts minor frequency fluctuations regarding parasites, bacteria, viruses and fungi. Experience shows that the accuracy of zapping is increased by wobbling and the integration of the adjacent frequencies in the range of ±3% is sufficient. The Device is officially approved in Europe as a medical product of the class Iia. Attention ! Persons wearing a cardio stimulator and pregnant women should not use this device! Uitgevoerd met vergulde handvaten voor optimale geleiding. Er kunnen 50 frequenties opgeslagen worden in het geheugen. Een uitgebreide lijst met geschikte frequenties wordt op aanvraag meegeleverd.